To Mason, yogurt is the ultimate treat. He loves it, I imagine, because it’s luscious, pure, simple, uncomplicated. I love giving him yogurt because it’s wholesome, filled with bone-building calcium and tummy-boosting Probiotics. I also appreciate how versatile yogurt is. I can serve it alone, or mixed into Mason’s oatmeal. I add peach yogurt to pureed chicken for something a little different. When we move on to other poultry and meat, I’ll mix beef with apple yogurt, turkey with pear yogurt, and lamb with apricot yogurt. This summer, I’ll freeze fruit yogurt into healthy popsicles. Plain yogurt is so easy to customize for your babe. Here are some of Mason’s favorite yogurt recipes to get you started. 1. Cook peaches. Drain, reserving some of the cooking liquid. Puree until you reach desired consistency. 2. Combine yogurt and pureed peaches. 3. Freeze leftovers in 2 to 4-ounces portions. 1. Wash, peel, and dice pear. Cook until tender (about 15 minutes). Drain, reserving some of the cooking liquid. Puree until you reach desired consistency. 2. Combine yogurt and pureed pear. 1. Peel and slice banana. Puree with pre-mixed formula or water until you reach desired consistency. 2. 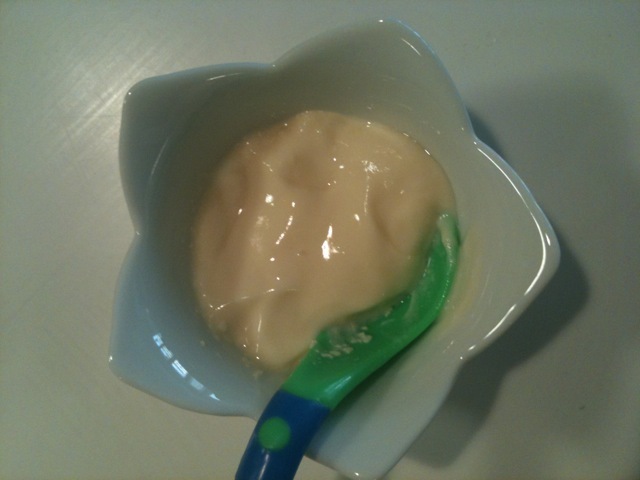 Combine yogurt and pureed banana. 1. Wash, peel, and dice apple. Cook until tender (about 15 minutes). Drain, reserving some of the cooking liquid. Puree until you reach desired consistency. 2. Combine yogurt and pureed apple. 1. Wash, peel, and dice mango. Cook until tender (10-15 minutes). Drain, reserving some of the cooking liquid. Puree until you reach desired consistency. 2. Combine yogurt and pureed mango. 1. Scoop out seeds from the center of papaya, then spoon flesh into a food processor. Puree until you reach desired consistency. 2. Combine yogurt and pureed papaya. 1. If using fresh apricots, wash, peel, and dice. Cook until tender (about 15 minutes). Drain, reserving some of the cooking liquid. Puree until you reach desired consistency. For dried apricots, dice and cook until tender (about 20 minutes). Drain, reserving some of the cooking liquid. Puree until you reach desired consistency. 2. Combine yogurt and apricots. 3. Freeze leftovers for up to up to one month in 2- to 4-ounce portions. *For each of the recipes above, use twice the amount of yogurt (in ounces) that you use of fruit. If your babe is older than my seven-month-old son, generally between 10 months and a year (check with your pediatrician), you can make your babe’s yogurt with berries. Choose ripe berries and follow the recipe for Banana Yogurt above. What’s your babe’s favorite flavor of yogurt? Next What Should We Make Next?